I stayed at Great Hostels Backpackers Los Pinos Banos with nine of my family members. The staff were wonderful and very accommodating to any request that we may have had such as warming up humitas or helping me cut my mango. It is a very welcoming and spacious place to stay with both private areas as well as communal areas. 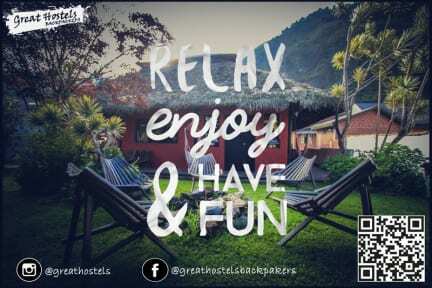 I frequently travel to Ecuador and the next time I return to Banos I will definitely stay at this hostel again. If you're in Banos you should stay here. Great location, rooms, staff, and travelers/dogs. I stayed longer than planned. Met great people here. Martin is a good dude. The place was perfect and very cheap! There is a bar where you can have a drink and meet people.They also serve food. Great outdoor yard with hammocks and a fire pit. It is just 5 minutes walk from the down. I loved to stay there I would recommend for sure! Great hostel to meet lots of friendly people. Very well organized and not to far from all the activities in Baños. I would recommend to any backpacker ! The thing i liked most aboit this hostel.was that the common area was comfortable and warm with cosy chairs and boardgames, jenga. The room was fine, there were initially some problems with flooding in the bathroom, which were then fixed. Location good near main road. Staff helpful though not very professional. Ordered food that was ignored, burnt, and then denied a replacement because of “no more bread” as I saw the lazy employee, Naraisa, look at more bread earlier.. but otherwise okay. Probably shouldn’t try to charge higher than $15 for a dorm bed during Carnaval going against the Dirección de Turismo of Baños. Go somewhere else if you enjoy quality staff and atmosphere, though there are good beer prices.